Corporal Denys “Jim” Fail 3504451, a retired Mechanised Transport Driver, has related this unusual tale about the former RAF Sopley domestic site camp, where the FONFA Museum now stands at the western edge of the new housing estate. 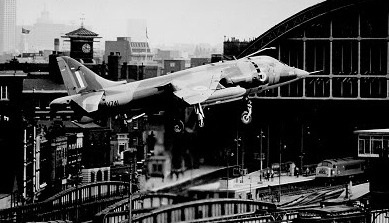 Photo Credit – PPRuNe Forums – Harrier GR1 taking off from the St Pancras Railway Station coal yard, London, flown by Sqn Ldr Tom Lecky-Thompson, in the Daily Mail London to New York Air Race in May 1969. “During the time I was stationed at R.A.F. Bicester, I was called upon to carry out some interesting tasks. One morning, an airman came up to me and said “The ‘old man’ wants to see you in his office”. I went to his office and Said “You want to see me, sir”? “Ah, yes” he replied, “You come from the New Forest area?” “Sort of”, I replied, “Actually, I come from Bournemouth”. “Now, we have a little task in the New Forest, apparently a Harrier aircraft has crashed and needs to be recovered and taken back to its base, Boscombe Down”. He instructed me to take a Queen Mary Trailer vehicle to Hamble in Hampshire, and pick up a rig which is fitted to the trailer so a Harrier aircraft can be transported by road. A Harrier aircraft had apparently crashed near Hurn Airport, and my task was to collect the said aircraft and take it back to Boscombe Down in Wiltshire. After a short spell, he said “Hang on a minute.” He went back into his office and made a phone call to the control tower, came back to me and said “They don’t know nuffing about a Harrier”. He then said “Ah, Just a minute, if you go down this road” and gave me some directions to the A338, which was a new road, which I didn’t know about. “Then on your left, you will see a gate with a sign indicating there is some experimental establishment within”. I drove in the gateway. And there was a Harrier aircraft sitting on a P.S.P. (metal pierced steel planking) take off area. I was told that the sealing material had been sucked up into the engine whilst the aircraft was attempting to take off, hence stalling the engine. At this stage, I had to plan my next move; I have to take this aircraft to Boscombe Down. Have I got enough petrol?? I don’t think so. I made a phone call to R.A.F. Sopley; the duty storeman told me “Come back on Monday”. I told him “I have to have fuel today”, he told me there is no chance of getting fuel on Saturday or Sunday. I then ordered him to have the fuel pump unlocked and ready for me within one hour. I continued on my way to Boscombe Down, when I came across another problem, Fordingbridge! There was no by-pass there in those days and for some reason Flags were erected right across the road through the town, I was just about to drive on and pull them all down when a policeman appeared from nowhere, held his hand up for me to stop, which I did. He managed to get a man to find a broom; then the man climbed on my trailer and hooked the flags over the wings. As I got to the other end of the town, Pickford’s (a civilian transport company) with a high load was waiting to come through in the opposite direction. Well, that’s not my problem! !